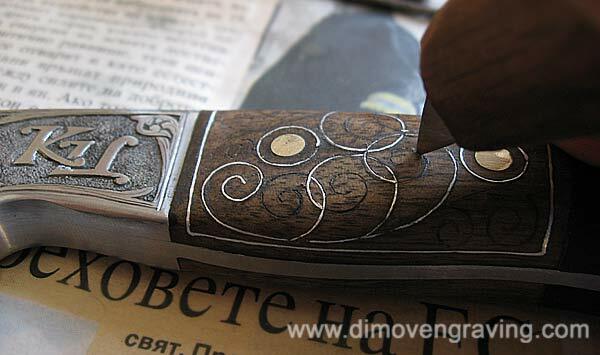 Several members in this forum asked me about my method of incrustation "contour" of metal in wood. 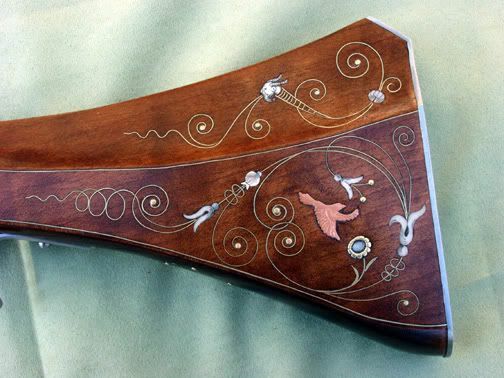 Great tutotial Evgeni,i was curious too in how you make this beautyfull inlays and today i have learn a little more,thank you for your kindness you are a great guy and a great artist! Evgeni, thanks very much for sharing your knowledge. Inlays on wood are a pretty thing, it is amazing how so different materials from nature mix together wonderfuly. Last edited by macsalvi; 07-21-2012 at 05:58 AM. Reason: New document added. Do you cut your lines with a straight knife, or parting? Thank you very much Evgeni for the tutorial in pictures. I watched your animation again. 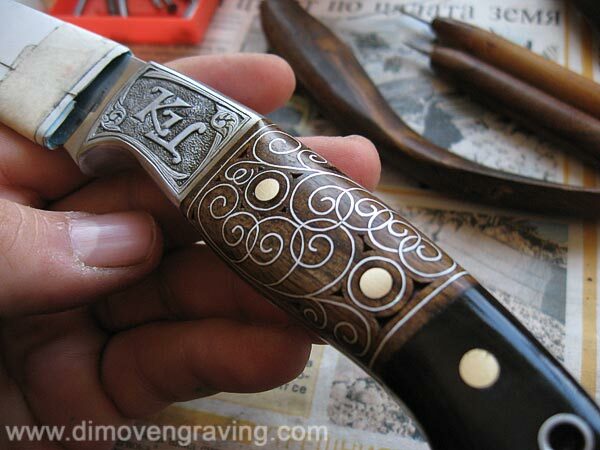 The way the wood burr is illustrated in the first step, it looks like a single line cut with a parting knife. In other words, the wood is cut, but no wood is removed... Would that be a correct charicterization? It is a very nice process. Evgeni, Thanks for sharing your techniques, really interesting and great work! Glenn C.
have removal a little material of base. Like everything else, there are many ways to accomplish the same thing. It's not really wire, it's flat ribbon. It can be brass, german silver, or silver. 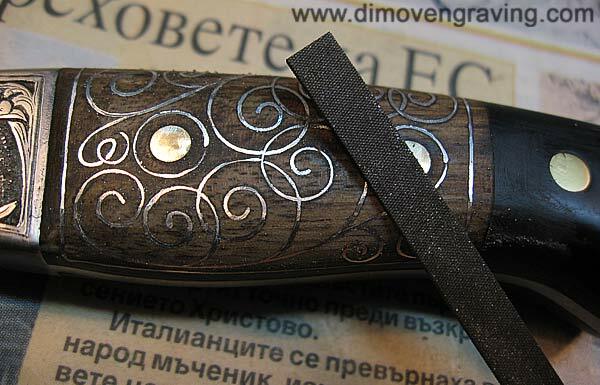 Pulling the ribbon over the edge of a file will provide the "tooth" required to hold it in the wood. You don't want to cut the wood, you want to compress and spread it. You first incise your line. Tools to spread the incision are often made from hacksaw blades. They can be bent to various shapes for going around curves and also cut to limit depth. They have a slight taper to compress the wood fibers as they are driven in. Once your wire is in place, the wood is wetted which causes the compressed fibers to swell and lock the wire via the "tooth" you made with the file. Thank you Evgeni for posting those images. Wonderful work!! As Dave Kanger said there are many ways to skin the same cat. I usually use fine silver that is dead soft. 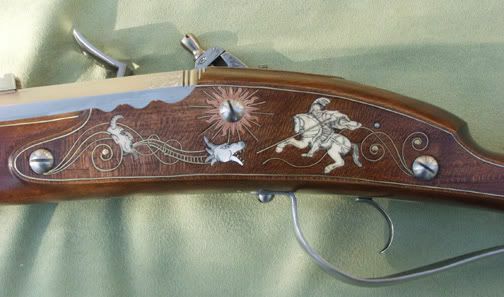 However, I used brass wire on the early 17th century gun I built shown below. It worked well but is a bit springy compared with fine silver. Dave's comments largely describe the methods I use. 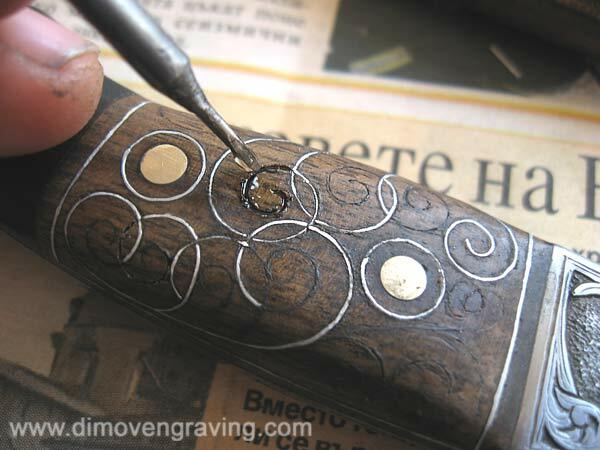 I incise the lines with small wood chisels and gouges, but I also use tiny cutters made from hacksaw blades. These are very small (<2mm) and when the edge is viewed straight on, the cross section is slightly oval shaped. In other words, the ends are rounded a little. That allows me to punch in a tiny curve without the chisel leaving a jagged line. THAT is way cool and well worth waiting for. Thanks for sharing the knowledge. Nice tutorial! Thanks for posting this. I understand the compression concept and how it would work on softer hardwoods like walnut. How would you handle this in some of the harder tropical woods like ebony, zircote, or even desert ironwood? In woods that are very difficult to "compress" do you actually need to "carve" a channel and glue the wire in? As I mentioned in an earlier post, we use flat ribbon wire. 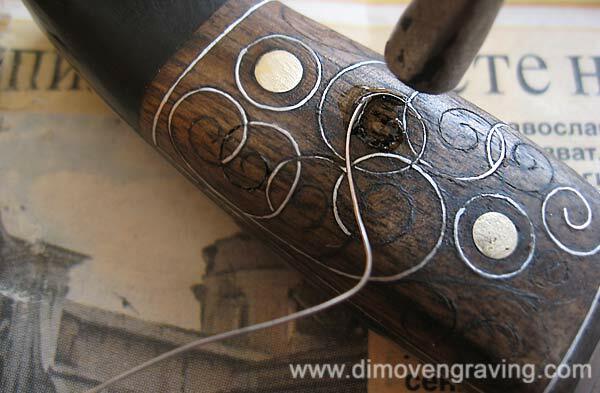 For those super hard woods, I suspect you would switch to round wire and inlay it as you would if doing it in metal. I think it would be really tough to use ribbon wire in a cut channel without some gaposis along the edges. I'm glad that this topic is discussed . 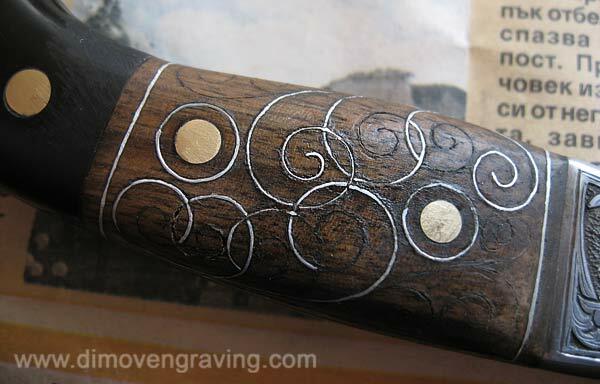 The problem with inlay of metall in exotic woods is rather in their low elasticity. Ray: "How would you handle this in some of the harder tropical woods like ebony, zircote, or even desert ironwood? 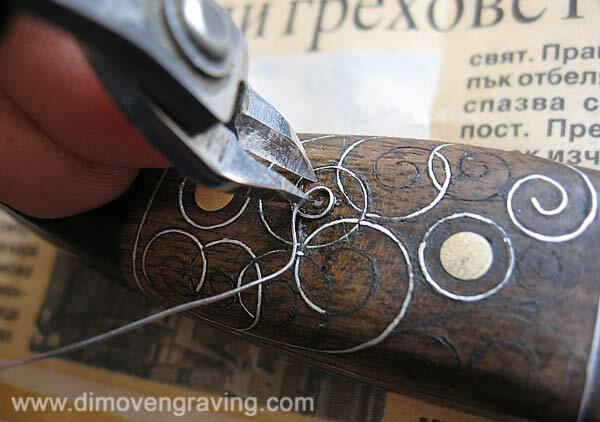 In woods that are very difficult to "compress" do you actually need to "carve" a channel and glue the wire in?" You mean like this, for example? Ebony and silver flute after an original from 1720. I developed the technique seventeen years ago, and made this ebony flute, which is now played by the Professor of Flute, Amsterdam Conservatory, Netherland.